Xenoposeidon is ten years old today! And it’s the oldest rebbachisaur! There’s just time before midnight strikes to wish Xenoposeidon a very happy tenth birthday. It came along just a month and a half after SV-POW! itself — in fact, I can’t even remember now, a decade on, whether part of the reason we started SV-POW! in the first place was so we’d have somewhere to talk about it when the paper (Taylor and Naish 2007) came out. Taylor 2017: Figure 4. NHMUK R2095, the holotype and only vertebra of Xenoposeidon proneneukos, in left lateral view, interpreted as a rebbachisaurid. This interpretation is modelled primarily on MNHN MRS 1958, a posterior dorsal vertebra from the holotype specimen of Rebbachisaurus garasbae. 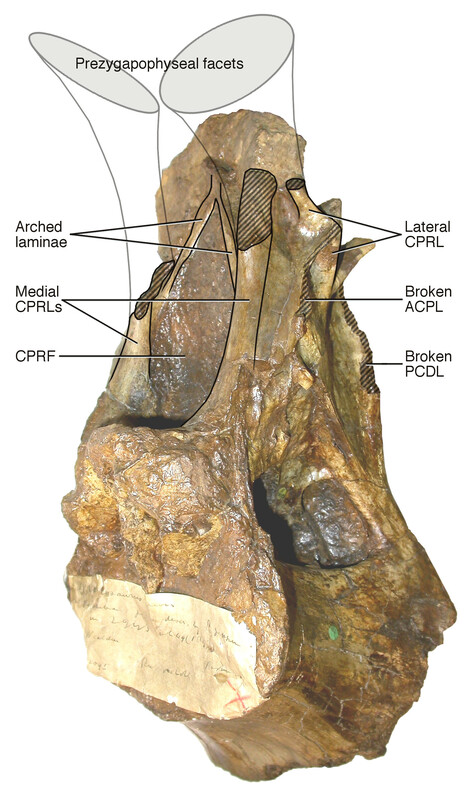 The CPOL passes through a sheetlike PCDL, as in Rebbachisaurus; but the lateral CPRL forms a cross-shaped junction with the ACPL, each of these laminae equally interrupting the trajectory of the other. Abbreviations as used in the text. Scale bar = 200 mm. For the last few days, I have been working away like a trojan, trying to ready a new manuscript for launching on this day. I’ve taken two days off from my day-job to get it done before this arbitrary deadline, and here I am writing about it with just 15 minutes to go! 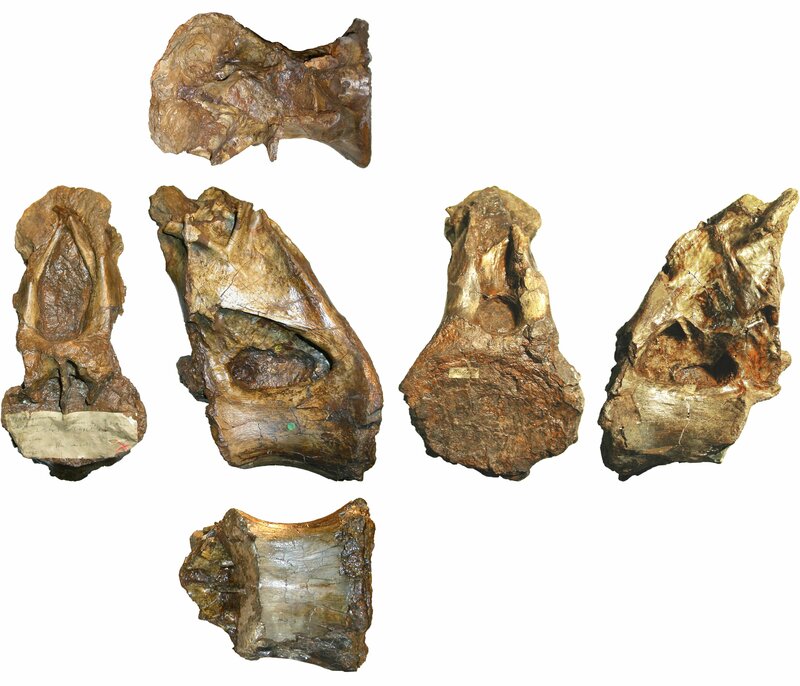 The title of this new manuscript (Taylor 2017) is “Xenoposeidon is the earliest known rebbachisaurid sauropod dinosaur”, and it explains in detail the argument that I made informally sixteen months ago when I first saw the rotating video of the Rebbachisaurus garasbae that Jeff Wilson and co put out with their then-new redescription of that species. I got it submitted (to PeerJ, natch) a bit more than an hour ago, and at the same time I clicked the “Make this available as a preprint” button. So as I write this, I am periodically checking back in the other window to see whether it’s made it through the basic editorial checks yet. The thing is, I really love Xenoposeidon. I admit that a surprising number of people (my wife, Matt, his wife, Heinrich Mallison, his wife) seem to think it looks like a turd. But I honestly think it’s the most beautiful single bone I’ve ever seen. It’s a privilege to work on it. Taylor 2017: Figure 5. NHMUK R2095, the holotype and only vertebra of Xenoposeidon proneneukos, in left anteroventrolateral view, highlighting the three sets of laminae related to the prezygapophyses. 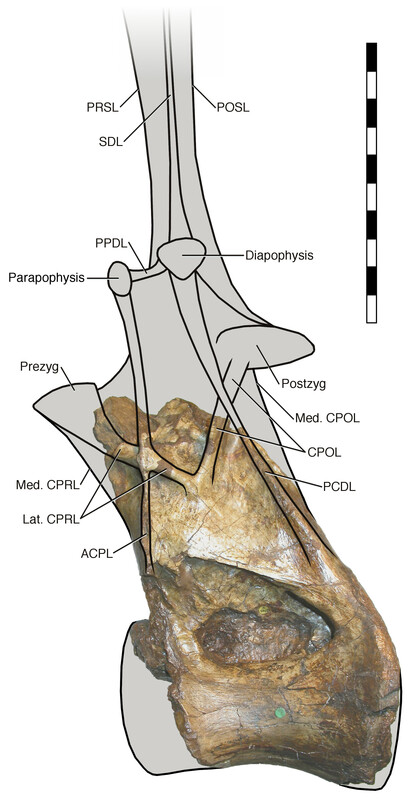 The trajectories of the medial CPRLs (which emerge from the neural arch pedicels) and the lateral CPRLs (which intersect with the APCLs) indicate the approximate position of the prezygapophyses. The additional arched laminae form the margins of the large, teardrop-shaped CPRF, but meet at a position some way below and posterior to the presumed location of the prezygapophyseal facets. Breakage of both medial CPRLs and the left ACPL and PCDL is indicated by cross-hatching. Note that, from this perspective, the lateral CPRL appears to turn a corner where it intersects with the ACPL, such that the posteroventral portion of the lateral CPRL appears contiguous with the dorsal portion of the ACPL. This is an illusion brought about by the eminence at the point of intersection. As always, this is much easier to see in three dimensions. Abbreviations as used in the text. Anyway, I’ll link to the preprint as soon as it’s up. In the mean time, I’m just going to bask in the beauty that is Xenoposeidon. Four minutes after posting this, and just three minutes before midnight, I got the notification from PeerJ that the preprint is up! So you are welcome to leave comments about the science on that page if you wish: I will take them into account when I revise the manuscript in light of the formal peer-reviews that will be coming along in due time. Congratulations! Now you’ve made it so that the most incomplete rebbachisaurid is one of the most completely described rebbachisaurids. I have to say, I spent quite a while just looking at the 3D model of the vertebra. It’s very cool to see material described like this (and, as someone with an entirely amateur interest in sauropods, publications which let you experience the next-best thing to seeing the fossil for real are incredibly helpful for me). Thanks, John, I’m delighted that the 3D model was useful for you. You say your interest in sauropods is entirely amateur; but short of getting your hands on the actual fossils, there is no better way to upgrade to a professional-level interest than by playing with models. « Is everything we know about sauropod phylogeny nonsense?